BlueMessage is a Digital Message Display solution that creates, delivers and scheduled new marketing and information individually to reach target audiences with real time information on large LCD Display. BluSignage attracts audiences by displaying different type of messages using vivid, high-quality video and animation replacing traditional LED signage and posters. BlueMessage uses single PC to manage and control multiple remote display devices, simultaneously and independently, from a central location via IP network. It delivers broadcast or streams individually the information to target audiences in various specific locations on schedule or ad hoc streaming across the closed network. BlueMessage is capable of playing back all industry standards, such as Flash files, Video .MPG, HTML, QuickTime, Power Point, .JPG's, Java Applets, and more. BlueMessage is the ultimate solution that provides both hardware such as streaming server, setup box or thin client, and Display Management software for the display and management of your digital content. It is highly cost effective and easy to use and is the perfect solution for both small-scale and large-scale projects. ► Lobby information channel; schools, hotels, shopping malls/centers and places of business. Set-top-box is used to convert movie clips to TV compatible signal. Create & edit messages centrally, with user-friendly editing functions. Message is created in Powerpoint 2007 as template. 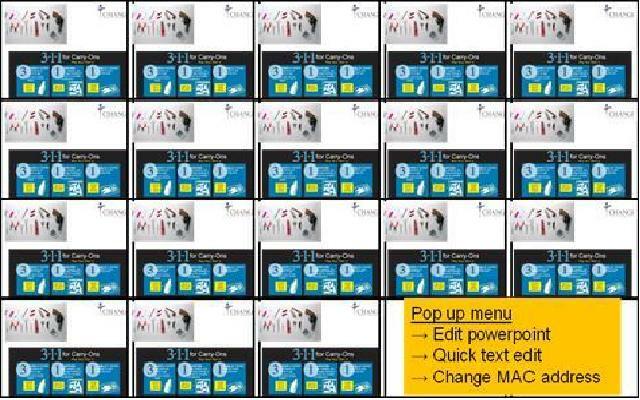 A matrix view to display current image on 18 screens, and allow editing individual message.